Elliott's Air Injected Tube Testers use supplied air pressure up to 125 PSI (8.5 bar) to quickly and easily test for leaks in tubes. Insert the seals into the corresponding tube ends and press the air valve, automatically locking the seals into the tubes. A drop of air pressure indicates a tube leak. 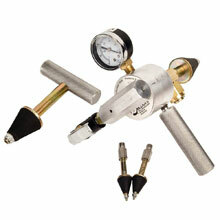 The Air Injected Tube Testers save time. An operator is able to test up to ten tubes per minute. Reliable – most commonly used method. Fast acting – lower labor cost. Seals sized to tube ID – positive seal. The Elliott 5556 Vacuum Tube Tester allows tubes with debris inside the tube to be tested efficiently. The tester utilizes a filter system to prevent debris from harming the tool. Filters are easily cleaned or replaced as necessary. Operating the Vacuum Tube Tester is simple. With the supply air connected, press the control valve button. An integral vacuum generator quickly and efficiently evacuates the tube. Any loss of vacuum indicated on the tester's gauge indicates a tube leak. The tapered seal design allows the operator to test a large range of tube IDs without changing to different seals, washers, or support rods. Quick method to check leaky tubes – less labor cost. Easy to operate – no special skills required. Less seal sets required – lower investment in stock. The High Pressure Test Plugs are ported to allow hydro testing of open end tubes and pipes at high pressure. The long wearing seals provide easy plug installation and removal. The unique design provides uniform Gripper expansion assuring 100% contact between the Gripper and the pipe or tube wall. This results in lower installation torque requirements and will minimize tube wall damage. All metal bearing surfaces are case hardened for increased abrasion resistance. Cadmium plating on all metal components provides increased corrosion protection. 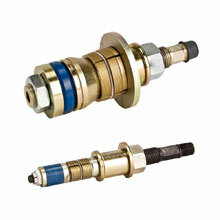 The brass washer and Fel-pro C5A lubricant protect threads and facilitate plug installation and removal. The oversized washer prevents the plug from falling into the pipe or tube. Replaceable seals- easy to maintain. The Elliott 5376 Vacuum Joint Tester is quick and easy to use, allowing operators to test up to 10 tube joints per minute! Just insert the seal into the tube and press the air control valve to expand the seal inside the tube. 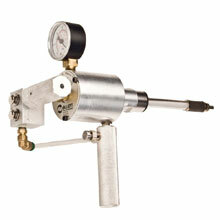 Press the control valve to divert the air through a venturi, creating a vacuum around the tube joint area. 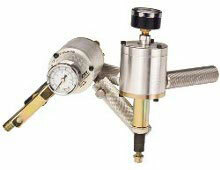 Any reduction in vacuum shown on the tools's gauge indicates a faulty tube joint. Seals sized to tube ID – more positive seal.